Green Valley kicker Conor Perkins (33) celebrates with holder Kyler Chavez (13) after making the winning extra point in overtime in a 42-41 victory over visiting Palo Verde. 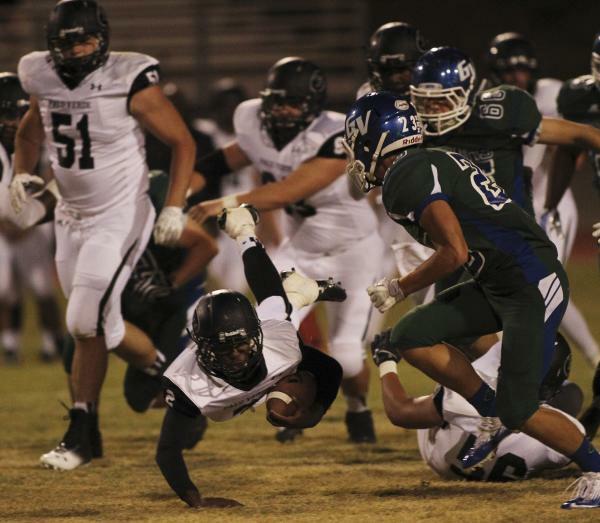 Palo Verde's Hykeem Massey (2) dives for a first down in front of Green Valley's Albert Lake (23) on Friday. Massey rushed for 104 yards on 15 carries. Green Valley's Conor Perkins (33) gets taken down by Palo Verde's Darrion Finn (4) on Friday. Perkins had four catches for 35 yards and hit the game-winning extra point in overtime in a 42-41 win. Green Valley's Jacob Rivero (6) makes an open-field tackle against Palo Verde's Jake Ortale (9) on Friday. 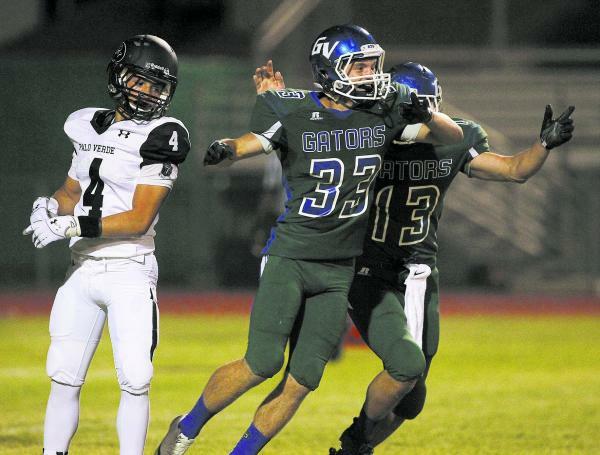 Ortale caught a pair of TD passes for Palo Verde, but the Gators edged the visiting Panthers, 42-41, in overtime. 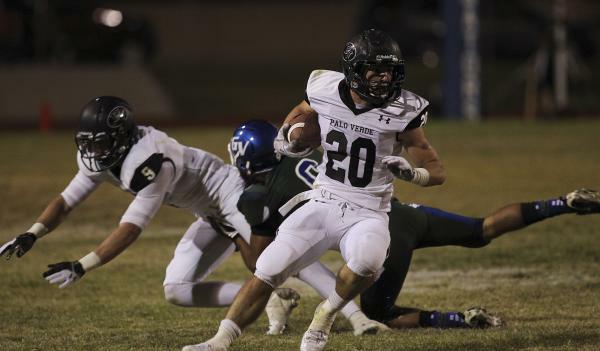 Palo Verde's Sean Dennis (20) breaks free for a long run against Green Valley on Friday. Dennis had 112 yards and a touchdown on seven carries. Green Valley's Jacob Tomlin (3) jumps in front of Palo Verde's Jake Ortale (9) for a fourth-quarter interception on Friday. It’s a play that’s often taken for granted in the game of football. 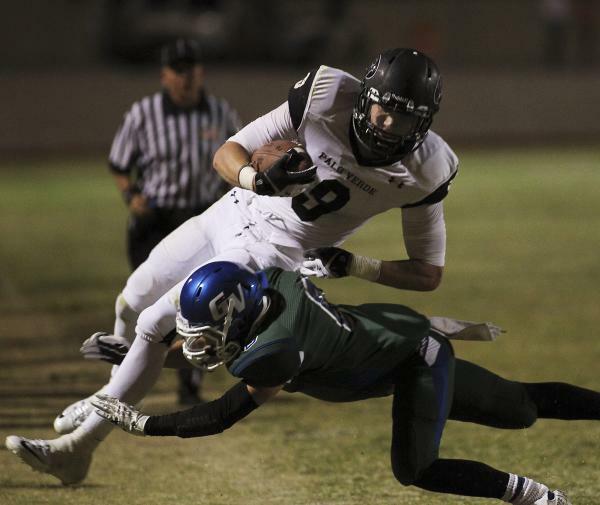 But an extra point was the difference for Green Valley on Friday night. Conor Perkins drilled his sixth extra point of the game in overtime to lift the Gators to a 42-41 home win over third-ranked Palo Verde. Palo Verde got the ball first in overtime, and Jaren Campbell scored on a 4-yard run to put the Panthers up 41-35. But Bradley Matsukawa missed the extra point, leaving the door open for the Gators. Christian Lopez hit Markus Varner with a 7-yard touchdown pass on the left side of the end zone to tie the game, and Perkins’ kick gave the Gators the win. “I don’t think I’ve ever had a more pressure-packed extra point,” Perkins said. A Palo Verde player was injured on Varner’s touchdown, delaying the point-after attempt, and the Panthers then took a timeout to try to ice Perkins. But it didn’t hinder the kicker. No. 9 Green Valley (2-2) led 35-27 with 4:03 to play after a 13-yard touchdown run by Lopez, his second of the game. 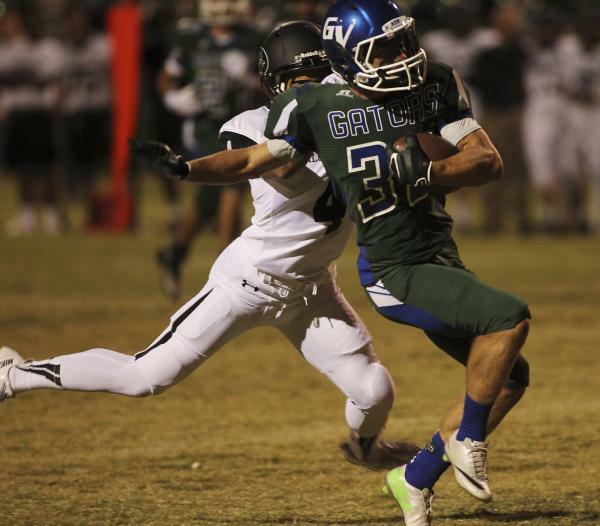 The Gators then forced Palo Verde (1-1) to punt with 2:32 to play, but a big turnover gave the Panthers a chance. Lopez was held up by the Palo Verde line, and Campbell stripped him and recovered the fumble at the Palo Verde 48 with 2:22 to go. Two plays later, Parker Rost hit a diving Jake Ortale with a 13-yard touchdown pass to cut the lead to 35-33. Rost then kept the ball on the conversion, going around the right side and diving across the goal line to tie the game. Palo Verde took a 27-14 lead with 7:42 to go in the third quarter when Campbell scooped up a fumble and returned it 31 yards for a touchdown. 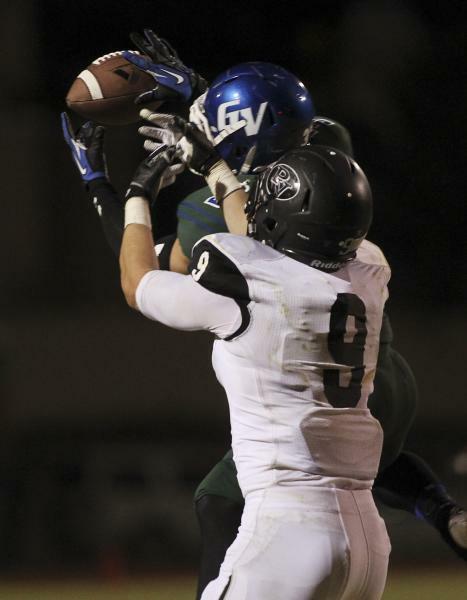 But Green Valley turned up the tempo, and answered with a pair of scoring drives that each took just over a minute. Lopez hit Giovanni Hernandez with touchdown passes of 16 and 21 yards, and Perkins nailed both extra points to make it 28-27. Lopez completed 23 of 36 passes for 249 yards and three touchdowns. Wide receiver Kyler Chavez also tossed a TD pass, taking a pitch from running back Albert Lake on the game’s first offensive play and firing a 67-yard TD pass to Hernandez. Hernandez had five catches for 122 yards and the three touchdowns, and Chavez caught eight passes for 73 yards for the Gators, who were coming off a 25-21 loss to Coronado last week. Ortale caught four passes for 87 yards and two touchdowns, and Sean Dennis rushed for 112 yards and a touchdown for the Panthers, who got 104 rushing yards from Hykeem Massey.